Mouna Hashem (@mannoush) published a picture several hours ago showing “Father Paolo praying with activists & doctors upon his return to the liberated #Syria suburbs last week” (see her tweet and the picture above). Dall’Oglio spent decades at the ancient desert monastery near Damascus leading interfaith dialogue. Last July 23, he spoke at an interfaith iftar meal at Rock Spring Congregational United Church of Christ in Arlington, Virginia, where Christians and Muslims celebrated the breaking of the day’s Ramadan fast. 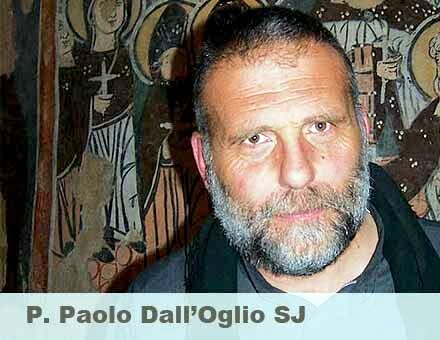 A native of Rome, Dall'Oglio says he developed an interest in Islam as a young man, specialized in Oriental studies and arrived as a priest in Syria 30 years ago. He founded a center for interreligious dialogue in a restored Byzantine monastery, Deir Mar Musa al Habashi (St. Moses the Abyssinian), situated in a breathtaking cliff-side desert site and featuring restored 11th and 12th century frescoes. Days after he left Syria to Beirut in June, he said he feels "solidarity with the youth of the uprising, those who are suffering, killed and tortured for trying to change society." Father Paolo is well known among Syrians for his work to improve understanding between Muslims and Christians. He refurbished the 1,000-year old monastery in Nebek, north of Damascus, which he opened to all faiths, as well as those of none. Christians and Muslims prayed and talked together, and gathered for each other's festivals. The regime saw this as a threat and withdrew permission for his activities before the uprising. Father Paolo subsequently turned the monastery into a place for fearful Syrians to come and for families to mourn lost relatives. Father Paolo told the Catholic News Service (CNS) in an interview last July he had published an open letter to Syria troubleshooter Kofi Annan saying a regime change in the country was necessary in order to restore peace and bring democracy. The letter, he told CNS, "was the immediate reason I was expelled." He has now come back to Syria for interfaith prayers with activists in the liberated Idlib suburbs.